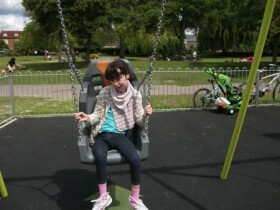 This week Wiltshire Council made me very happy, I took Paige my granddaughter along to the refurbished children’s playground in our local park in Salisbury, I had read that it would have things for disabled children as well as the normal playground things. The playground had been totally restructured so it was easier to get a wheelchair in and around the playground, the flooring is a soft type of weather proof matting instead of the bark shavings it used to have, which wheelchair get stuck in, but the best things are the swings, although only one of them at least it is a start. It is a deep seat swing designed for a disabled child although no harness on it you could always take one along and clip it on, Paige was so comfortable and just want to stay in it swinging watching all the other children have fun too, then we moved round to the roundabout which I just pushed her chair onto put the brakes on and around she went laughing and smiling. One thing did bother me though Mum’s and Dads who had no idea that these particular things had been designed for disabled children to use, we got stared at on the roundabout and for the swing we had to wait while a father pushed his able bodied daughter of about 8 years in the swing while the normal swings stood empty, I think it would help if the councils put up a sign letting people know that the idea is for disabled children to join in with able children so they play together after all they are all children and thankfully Paige had a wonderful time and did not mind waiting for a turn on the swing, I just hope it is the first of many playgrounds like this.